ProjectX Blog » Blog Archive » NZ Homepage Drag Race – Chrome vs IE8 – which is faster ? « Background to the "Forgotten Art of Web Performance"
Recently, Gomez released information that Google Chrome was the fastest browser from real world testing. That got me thinking, how does Chrome compare to IE8 for New Zealand webpages. For most websites, IE8 is the most popular browser, so it will be an interesting piece of research. I’ve created a mini-test of 40 New Zealand homepages. I’ve split the test into 4 tests of download performance, that represent a cross-section of the best and the worst that NZ homepages have to offer. I want to see if the “quality” of a page affects the ability of the browser to download and render the pages faster. Also, I want to see if network speed has any affect on the ability of browser to the load the pages faster. From a technical point of view (browserscope), both browsers have network similar capabilities – both browsers can load from 6 hosts at once and have a maximum of 35 connections open at one time. All of the site were selected from the previous full download speed audit in July. Full results and videos of all 40 tests are available on the Google docs spreadsheet. Chrome is at least 51% faster than IE8 faster across all tests. There was some “glitches” where IE8 was faster by a couple of seconds eg. On Geekzone.co.nz, IE8 loaded the page 2 secs faster than Chrome. IE8 and Chrome were more evenly matched for the top optimised pages. For DSL speed, it was a tie 5-5 between Chrome and IE8, 20mbit it was 7-3 in favour of Chrome. The most interesting point of the tests was for the slowest and least optimised sites, Google Chrome loaded slow and poorly optimised websites a lot better than IE8. Google Chrome was hands down winner (40-0) for the slowest and poorly optimised sites for both network speeds (1.5Mb and 20Mb) . Chrome was between 41%-114% faster than IE8! We’ve confirmed that Chrome is the fastest browser and it will load bad websites faster than IE8. So if you want to experience the web as fast as possible, make sure your using Chrome. Do you need another reason to switch? This entry was posted on Tuesday, August 30th, 2011 at 9:18 pm	and is filed under All Posts. You can follow any responses to this entry through the RSS 2.0 feed. You can leave a response, or trackback from your own site. Why didn’t you use IE9 in your tests? I assume you used the latest released version of chrome. I used what was available on the webpagetest.org node for Wellington which is IE* and Chrome. The Chrome version is 13 which is the latest version. 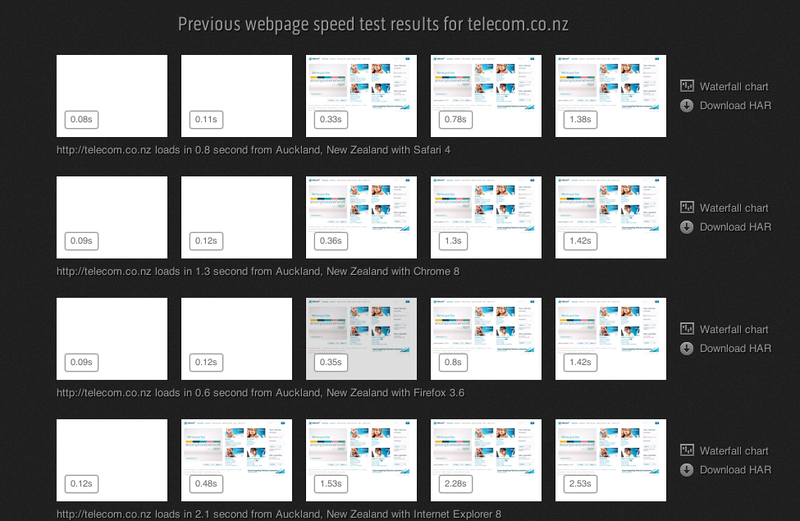 Loads.in service shows IE8 vs Chrome 8 vs Firefox 3.6 vs Safari 4 – here’s the load time from Auckland to telecom.co.nz . IE8 is slower than the rest. And chrome still wins … just.